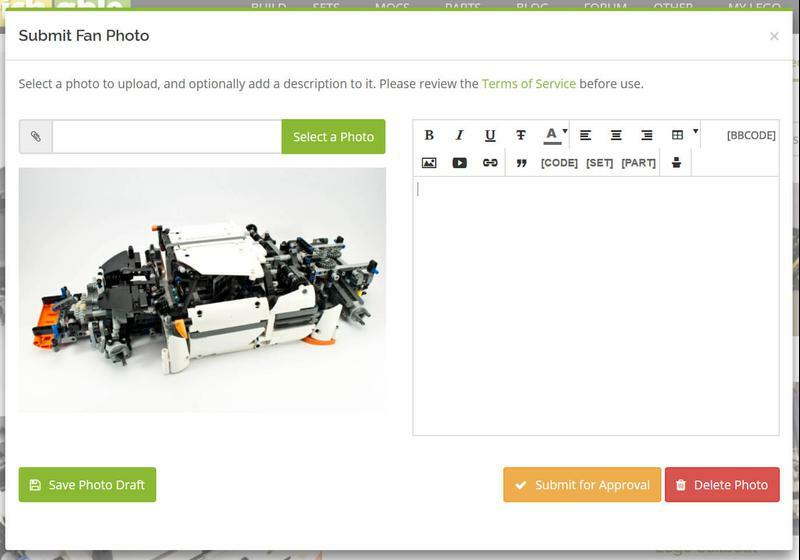 You can now upload your own photos of MOCs you have built, or modded. 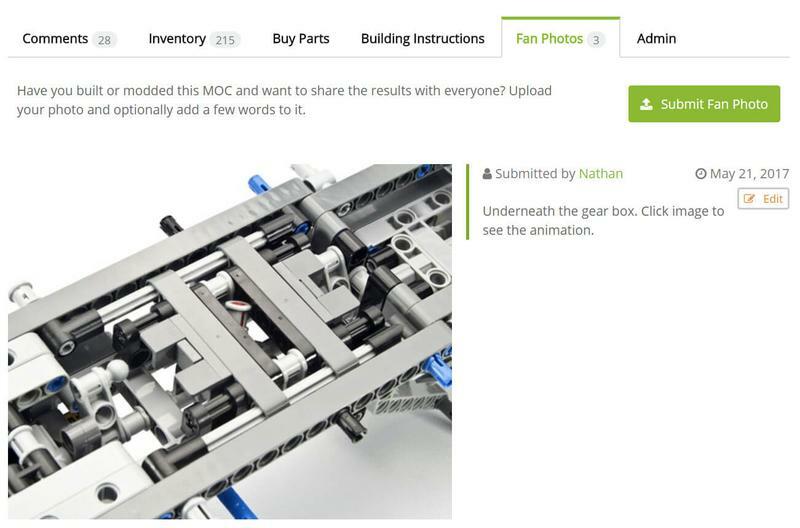 This is a great way to show off what you've built, and provides some great feedback to the MOC designer. Select a photo, add some text if you want and click Save Photo Draft. When ready, click the Submit for Approval button. When your photo is approved it will be visible to everyone, and the designer of the MOC will be notified via email (assuming they have notifications enabled). As an example, I have uploaded some photos I took of Nathanaël Kuipers' Predator Supercar. There are also two others already uploaded and approved before I even managed to finish this blog post: DLuders' Fidget Spinner and Sheepo's Mustang. To assist with adding images for all the Parts we are missing, I've added a new page for logged in users: Missing Images. This will show a list of all parts that do not have images that are in your configured LEGO collection. At this stage, it will only list parts that have no images at all - i.e. no LDraw or LEGO Element images. This will allow the photo to be displayed in inventories when nothing else is available. Later on, I might expand it to more parts once these higher priority ones are taken care of. The minimum Level for submitting Part Photos has also been reduced to 2 to assist with this effort. I've added back the old v2 Buy LEGO Sets page. It is much improved this time around, and while building it I was able to make many improvements to the accuracy of the prices pulled back by the Amazon and eBay product feed processing jobs (they don't make it easy!). It also includes BrickLink and BrickOwl data. You can use the Buy LEGO Sets page to find the best discounts for LEGO Sets of interest. You can filter by theme/year/store type/etc, or even just the Sets in your Wishlists. All prices are accurate to within 24 hrs, usually much less. Also shown is the average price for each set, based on known and reliable prices. The historical average price per day is also available via the Set Watch icons on each result. Can you please submit a Forum request with the BL and BO numbers if you have them, and an Admin will create the parts for you. "Part Images" / "Fan Photos" & "Buy Sets" was a great Idea and Function. Thank you! Looking closer to the list there is sticker sheet in there, I have applied most of those would it be possible to allow the system to ignore those. Because I can't really take a photo of them. Someone else might have them. As an aside do you want us to add sticker sheets to sets which don't already have them in the inventory? Well yeah but I was referring to me removing it from my list not from everyone else. Great additions maybe is should build a few MOCs now, and let see 235 parts missing images. That quite alot of work right there. maybe you should make that list step it up for those who actually get a zero. ie they get the result of priority 2 parts, if no such exist either go to priority 3 parts. The missing picture page is a very good idea. I'm just sad that I literally finished going through my parts yesterday. Still it will help when I get new stuff. It cold also be nice to have the option to include parts with "similar image". "Similair Image" is a good one. We try to get rid of those, so a list with them will be usefull. I like the fan photos addition. Any chance we can have the option to add more than 1 pic when submitting an original MOC? Right now it has the option to link pictures from other sites, but it would be nice to be able to add them here. 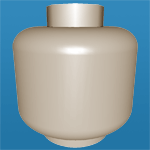 If you add a Bricksafe page to the "details URL" it will generate a slideshow of images automatically. Otherwise, you are free to add extra images in the description below the main image. Ps. We are working on the change requests with parts that need a new category. But most of those parts also need a rename and bricklink link. So it's not going as fast as expected. It was 7953 - Buzz's Star Command Spaceship. It was to add the parts for the minifigures in the set. So probably 8-10 submissions. Thank you, lol I am the one who tried the Fan Photo (feature I love) for the Fidget spinner. Thanks for all the work you for all the work you do!! Finally, an easy way to get missing pictures sorted! I see some odd, rarely used parts, so hope I'll find time to contribute as I do on Bricklink. I like the missing images feature. Is there anyway you could exclude parts which are listed as lost in our sets? great functionality - great improvements for us diehard fans of rebrickable! missing images of parts that I have -- now that's an easy way to contribute, love it!